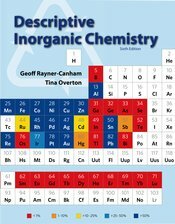 This bestselling text gives students a less rigorous, less mathematical way of learning inorganic chemistry, using the periodic table as a context for exploring chemical properties and uncovering relationships between elements in different groups. The authors help students understand the relevance of the subject to their lives by covering both the historical development and fascinating contemporary applications of inorganic chemistry (especially in regard to industrial processes and environmental issues). The new edition offers new study tools, expanded coverage of biological applications, and new help with problem-solving.